(Reuters) – Two people died in bomb attacks in Bangladesh on Friday, raising the death toll to at least 34 in increasing political unrest as a stand-off between Prime Minister Sheikh Hasina and the main opposition leader over last year’s election has deepened. Begum Khaleda Zia, whose opposition Bangladesh Nationalist Party (BNP) boycotted the election on Jan. 5 last year, has demanded that Hasina and her government step down for a new vote held under a caretaker administration. Hasina has refused, instead tightening her grip by arresting key opposition leaders and clamping down on critical media as anti-government protests spread. The violence has worsened markedly since the first anniversary on Jan. 5 of the vote. 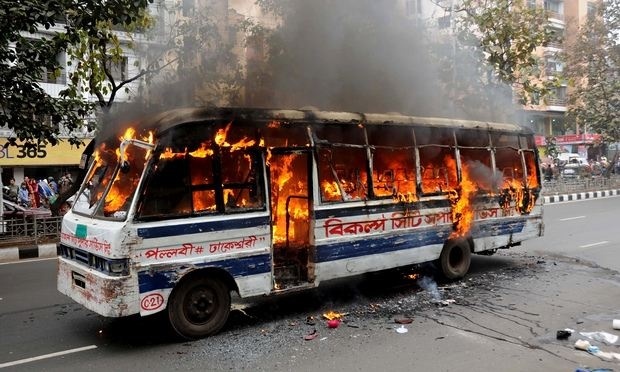 In addition to the two deaths, at least 40 people were injured, some critically, after opposition activists firebombed a number of vehicles late on Friday in the capital Dhaka and surrounding districts, police and witnesses said. The Dhaka government has banned pillion riding on motorcycles in an effort to prevent arson attacks and also announced a bounty of 100,000 taka ($1,280) for information leading to the arrest of those involved in violence. Khaleda called an indefinite transport blockade after she was prevented from holding a mass rally in Dhaka on Jan. 5, the first anniversary of the disputed election. The United States, European Union and Britain have voiced concern and urged all Bangladeshi parties to engage in dialogue.